Early this morning Vimov provided us a sneak peek at their iPhone port of Hexen II. It’s a work in progress, as currently there’s no music yet, the menu system hasn’t been implemented, the controls are basic and nowhere near final, and they’ve got a bunch of performance tweaks to implement to make it run across the whole iPhone and iPod touch device family. But other than that, it’s all there. 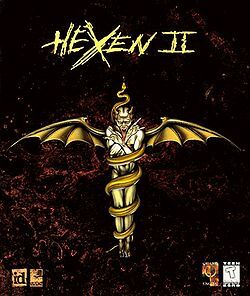 Hexen II is, obviously, the sequel to Hexen (which was the sequel to Heretic) and was developed by Raven Software and published by Id for the PC in 1997. This first person shooter utilizes a modified version of the Quake engine to add a roleplaying element to the game where players could choose from multiple classes, and increase statistics by earning experience throughout the adventure. 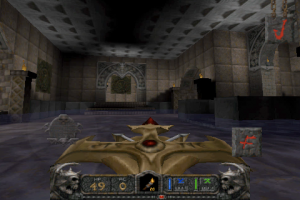 The sticky situation that the developers of this Hexen II port face is that, while the actual game source itself has been made open source, the data files that make Hexen II more than just a modded Quake engine are not open source. 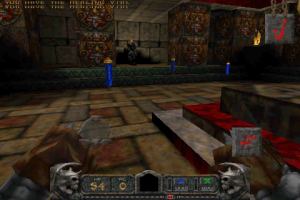 The preview version we were given is utilizing assets from the free Hexen II demo, but the game itself can’t hit the App Store until the developers work our some kind of licensing agreement with Activision.